Find a Discovery trip that explores Greece And Turkey. There are 71 tours to choose from, that range in length from 7 days up to 19 days. The most popular month for these tours is August, which has the most tour departures. "My contiki trip was incredible, primarily due to our tour guide Martina Musso. Her..."
"Accommodations for the cruise quarters was the only disappointment. We were not given..."
"Our tour was absolutely amazing. 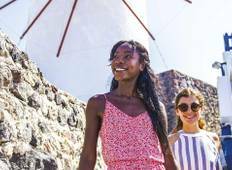 Our bus drivers were great, our local guides were..."
"Busy but good ...tour guides at sites normally very informative.. too much shopping..."
"My daughter (aged 21) and I celebrated the completion of her degree with the Mediterranean..."
"Excellent tour... The spotlight on Greece was very indepth and a good chance to learn..."
"My experience in this tour was amazing!. My favourite place were Turkey. 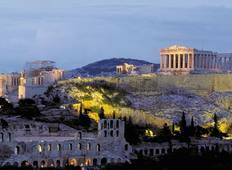 Greece was..."
"I love it....everything was great especially the Guide tour Oriana; SHE IS THE BEST..."